Hosted in Munich, electronica is one of the world’s leading trade show for those in the electronics industry. The conference features more than 2,500 exhibitors from 52 countries and covers 133,000 square meters of exhibition space. The range of exhibits at the four-day event covers every aspect of electronic components and systems. Last year, more than 2,700 exhibitors from 80 countries and approximately 73,000 visitors attended the conference. This year, more than 80,000 people attended electronica. 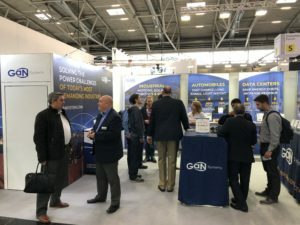 As I walked the halls of the venue and attended a number of the sessions at electronica, I observed how the conversation around power electronics has changed. This year, more so than in the past, I couldn’t help but take note that GaN technology was a topic of discussion. And why? Because without GaN – more powerful, energy efficient, smaller, lighter, and cost-effective power electronics would not evolve in ways to drive product innovation. Automotive is driving innovation in power electronics and vice versa. 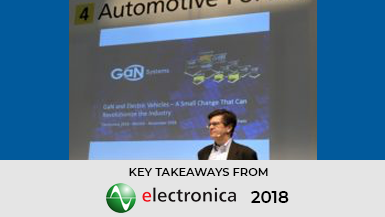 At electronica, GaN Systems’ CEO Jim Witham presented at two sessions focused on the automotive sector. 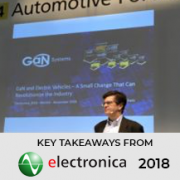 The themes of the sessions were related to powering the next generation of vehicles and how GaN is paving a path to new and improved power electronics in electric and autonomous vehicles and the entire network supporting the ecosystem. It’s interesting to see how automotive has become one of the central themes at global conferences from electronica to CES. 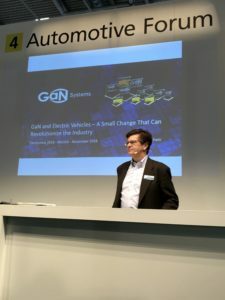 At our booth, there was significant interest in GaN applications, as we watched visitors move from automotive to the industrial, data center, and consumer areas of the GaN Systems’ booth taking note about how GaN is being used in the real world. Higher power systems can now enjoy the benefits of GaN. We’re moving at a faster pace than ever before now that GaN is proven and demonstrated to be reliable and easy-to-use. Numerous conversations we had at electronica focused on our newer products including the record setting 120 A, 100 V and 650 V GaN power transistors, new design tools, our expanding list of reference designs with partners and customers. Most importantly, attendees wanted to become familiar with the implementations of our products into end customer systems. Electronics are at the center of everyone’s lives and requires rapid improvements as they create more demand for energy to power them. At electronica, the emphasis for high efficiency, high power density, and low-cost power electronics products has never been clearer. And with GaN, as demonstrated at electronica, we’re witnessing GaN becoming the fundamental building block in developing new and improved power electronics.